Tourist Attractions: : Delhi, Dhampus, Landrung, Chomrung, Dovan, Machapucchare Base Camp, Annapurna Base Camp, Dovan, Chomrung, Gandrung, Pokhara, Kathmandu, Delhi. On arrival at Delhi, transfer to the hotel. Rest of the day at leisure. Overnight at hotel. Enjoy a morning tour of Old Delhi, where you can visit the ancient monument of Red Fort and crowded bazaars of Chandni Chowk, one of the most popular places to shop at. Later you can visit Jama Masjid, the greatest mosque in India and the Raj Ghat. A tour to New Delhi where you can visit the Qutab Minar and the colorful Birla Mandir.Besides this; a drive along Rajpath would let you see sights as the Parliament, President's Palace, and India Gate. Overnight at the hotel. 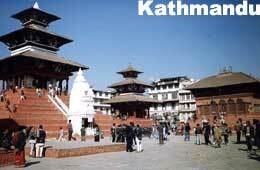 Transfer to airport to catch flight to Kathmandu, on arrival transfer to hotel. Rest of the day at leisure. Overnight at hotel. Full day city tour. Overnight at hotel. Drive to Pokhara, on arrival check in at the hotel. In the afternoon you can explore the beautiful Pokhara Valley. Overnight at hotel. The starting point of our trek is Dhampes Phedi. Move towards the northwest through Yamdi Khola valley to reach here. From here a 02 hours trek would lead you to the lovely village of Dhampus, strung out on a ridge, inhabited by the friendly Gurungs. Overnight at tents. From Dhampus you can move for Landrung.While driving you will come across forests and villages with the very welcoming teahouses. On arrival at the Deurali (6,890 ft), walk down to the Bheri Kharka - Sheep Pasture, high above the Modi Khola valley. Here you can have your lunch. Overnight in Landrung. Visit the Modi Khola valley; here you can take a view of South Annapurna, Hiunchuli, Gangapurna and Machapuchhare. Lunch is at Jhinu, Overnight at tents. Despite modest linear distance covered the trail makes a constant switch back through the Modi Khola gorge. In the initial stage of the walk the route gives the possibility of views but later as the trailheads among rhododendron and bamboo forests it gets scarce but here the birds and Languar monkeys abound. You stop at Bamboo for lunch - a teashop amidst, one can guess - bamboo. From here an hour's walk would take you to Dovan, a place with three teahouses in a narrow, shaded valley. 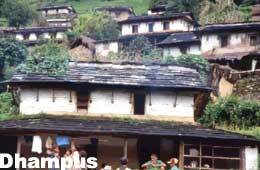 We will walk into the interiors of the Modi Khola valley. The trail winds up among bamboo thickets and forest to the famous Hinku cave that once housed a lodge. The cave lies separated from Deurali. Beyond Deurali the temperature vegetation quickly transforms into short, stunted Alpine. You can take a view of the Machapuchhare and the surrounding Mountains from Machapuchhare Base Camp. The trek to Annapurna Base Camp ascends at a steady gradient, never very shortly, but the altitude is likely to have a tiring effect. Do not hurry, but ascend slowly & enjoy the expanding panorama. It's a clear, well-defined trail and as you gain height the lodge buildings can be seen ahead. The final rise is the steepest. After some time at this wonderful vantage point we turn back to retrace our steps going all the way back to Dovan. Trek up to Chomrung and spend overnight there. This day you descend to Kimrong Khola on a fairly steep trail through Oak Forest for lunch. Then it's up again on the southern side to the picturesque village of Ghandrung with the last close views of Annapurna South and Huinchul. 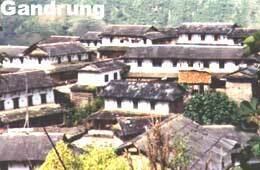 This large and prosperous village is also the headquarters of the very successful Annapurna Conservation Area. Continuing your trek, head south then southwest towards the road head at Nayapul, half an hour away after crossing the Modi Khola at Birethanti. From here drive to Pokhara. As you leave Ghandrung you can see beautiful mountains while passing through the road heading to Pokhara. On arrival check in into hotel. Overnight at hotel. Drive back to Kathmandu, on arrival check into the hotel. Overnight at hotel. Transfer to Airport for flight to Delhi, on arrival transfer to hotel. After dinner you will be transferred to the airport to catch a flight to onward destination. 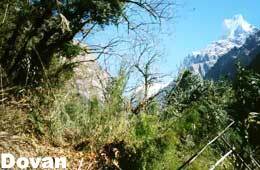 India Profile offers online information and booking for Annapurna Sanctuary - Trekkers Delight Tour, India. For more information or to book your tour, please fill up the form given.